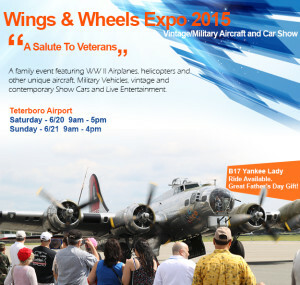 The New Jersey Aviation Hall of Fame and Museum Hosts Wings and Wheels Air Expo at Teterboro Airport Father’s Day weekend, June 20 and 21, 2015. This premier New Jersey aviation event features WWII airplanes and other unique military aircraft, vintage and contemporary show cars and live entertainment. Fun for the whole family! You can expect to see an Aero L-29, a Curtis SB2C Helldiver, a P-47 Thunderbolt, and a Grumman TBF Avenger. The Helldiver and Avenger entered shipboard carrier service with the Navy in the middle of the second World War and together brought the fighting to Japan and sent much of the Japanese navy to the bottom. The Hellldiver is a first-time, new addition to Wings and Wheels with a unique New Jersey connection as being a Curtis-Wright aircraft powered by a Wright R-2600 Cyclone engine. More aircraft are expected and of course, and the perennial star attraction, B-17G, Yankee Lady, will return and offer once-in-a-lifetime rides experience and keep the airshow buzzing! The New Jersey Aviation Hall of Fame and Museum strives to celebrate and bring-to-life all facets of aviation by honoring its past, and to captivate and charm those who will be its future. This entry was posted in Announcements/News, Events and tagged Aviation event. Bookmark the permalink.